Taking a family vacation is exciting, and the best ones happen when you choose a place that the whole family will love. If you have children over 10 years old, then Vitti Villa is the place. It offers everything you could want on your vacation, and the contemporary villa has many amenities you won’t find elsewhere. Besides the location in Lurin, one of the main attractions here is the easy beach access - Shell Beach is within walking distance! You’ll also love the convenient location near restaurants for dining out, and the peace and privacy at Vitti are unbeatable. There’s plenty of space in the 5 bedrooms, and lots of indoor and outdoor living areas for relaxing. Vitti Villa offers it all for a great vacation. Great views of the island, ocean and sunset! 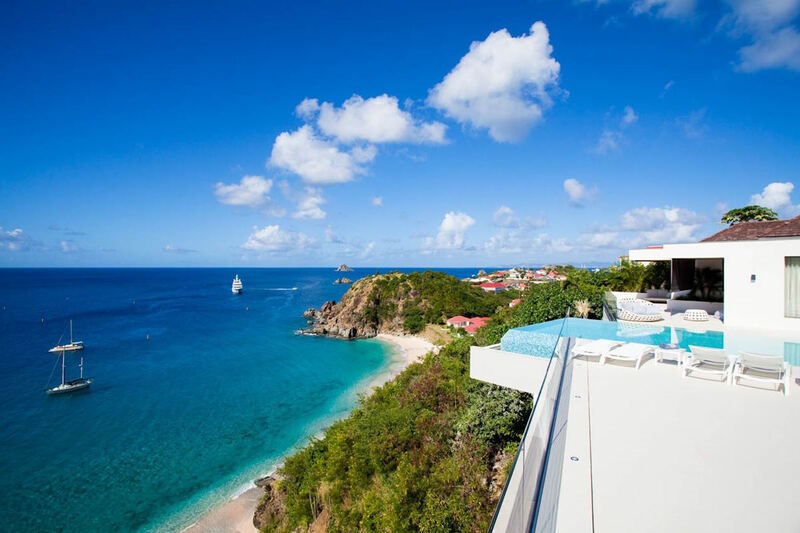 Villa Vitti is a 5-bedroom, 5.5-bathroom contemporary style St Bart’s villa rental offering some of the best island and sunset views. Located on a Lurin hillside overlooking Shell Beach, this nicely appointed villa has tons of peace and privacy and is within walking distance to Shell beach. It is also just a 2-minute drive to Gustavia for restaurants and boutiques. Every detail of Vitti has been carefully designed with your comfort in mind. The large Great Room opens to the terrace with the heated infinity pool, which is a perfect place to gather for an evening cocktail party. You will love the tropical garden in the back, too, and the gourmet, professional kitchen is ideal for preparing meals and drinks. The 5 ocean view bedrooms all have en-suite bathrooms, so there is plenty of privacy for guests. Two bedrooms are located on the main floor, with three other bedrooms on the lower floor. This villa is the perfect place for entertaining friends or family (with children older than 10) for a wonderful St Bart’s vacation. Rental rates include continental breakfast delivery every morning in High Season (fresh bread and croissants) and turn down service. Bedroom 1: On the main floor with an ocean view, king-size 4-poster bed, air-conditioning, flat-screen television with Dish Network, DVD player, Sonos and Ipod dock, telephone, safe, mosquito screens. The bedroom opens onto the pool terrace. En-suite bathroom with rain shower and regular shower-head, hair dryer, bathrobes, towels, and beach towels. The bathroom opens onto a private garden. Bedroom 2: On the main floor with an ocean view, king-size bed, air-conditioning, flat-screen television with Dish Network & Canal Satellite, DVD player, Sonos and Ipod dock, telephone, safe, mosquito screens. The bedroom opens onto the pool terrace. En-suite bathroom with rain shower and regular shower-head, hair dryer, bathrobes, towels, and beach towels. The bathroom opens onto a private garden. Bedrooms 2 and 3 are interconnecting. Bedroom 3: On the lower floor with an ocean view, king-size bed, air-conditioning, flat-screen television with Dish Network, DVD player, Sonos and Ipod dock, telephone, safe, mosquito screens. The bedroom opens onto a terrace with living area (naturally cooled by a gentle breeze, the area is perfect to relax while reading or gazing at the ocean view). En-suite bathroom with rain shower and regular shower-head, 2 wash basins, hair dryer, bathrobes, towels, and beach towels. Bedroom 4: On the lower floor with an ocean view, king-size bed, air-conditioning, flat-screen television with Dish Network, DVD player, Sonos and Ipod dock, telephone, safe, mosquito screens. The bedroom opens onto a terrace with living area (naturally cooled by a gentle breeze, the area is perfect to relax while reading or gazing at the ocean view). En-suite bathroom with rain shower and regular shower-head, 2 wash basins, hair dryer, bathrobes, towels, and beach towels. Bedroom 5: On the lower floor with an ocean view, queen-size 4-poster bed, air-conditioning, flat-screen television with DVD player, telephone, safe, mosquito screens. The bedroom opens onto a terrace with living area (naturally cooled by a gentle breeze, the area is perfect to relax while reading or gazing at the ocean view). En-suite bathroom with rain shower and regular shower-head, hair dryer, bathrobes, towels, and beach towels. Private stair access down to Shell Beach! High season only: Continental breakfast – fresh fruit and French pastries – every day except sunday and public holidays.